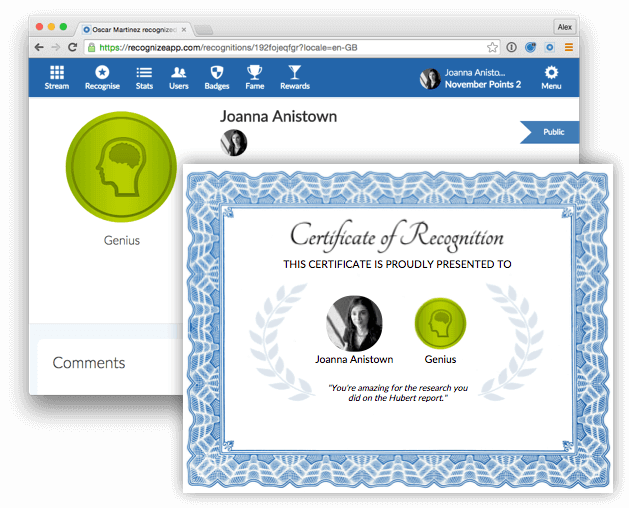 Create certificates for staff awards by clicking print on any recognition. Create a badge only executives can send once a year. Award this badge to a special employee. Print the certificate and present at an annual company event. Make a special type of badge in Recognize. Admins and HR can make badges that can only be sent by specific people. Change the badge scarity to once a year or once a quarter. Discover someone that deserves a staff award. The Recognize Reports can help in your search. Send the nominated employee a recognition with the special badge. On the recognition web page, click print to create a certificate! That's it! Recognition, rewards, and awards for staff happiness.